I relish (through my ears) anything “Marsalis” much (so much) more than anything “Marsala”… be that veal, chicken, whatever. My little brother, Drew, doesn’t fly fish at all, so I’ve already caught more fish than he’ll ever dream about. But one thing he has me insanely jealous about is the fact that he has played golf with Branford Marsalis. The sax player. Son of Ellis, brother of Wynton. When “Bran” (my brother calls him that) is in the Philly area, they sometimes hit the links. I’m told Bran has some serious game. Which doesn’t surprise me much, because golf, like fly fishing, is very much about timing and tempo. And yet, in jazz, and golf… and fly fishing… while the standard rules about timing and tempo are important to help you get in the game, it’s the ability to improvise beyond a straight “1-2-3-4” rhythm that separates the artists from the rest of the crowd. Okay, let’s bring the lesson back into our fly-fishing wheelhouse. 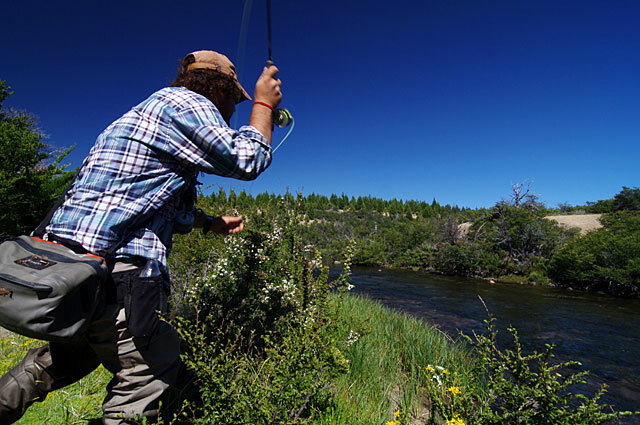 We fly anglers are taught all about the “four-count” rhythm when it comes to casting: back on one, pause on two, forward on three, back again (to load the cast more) on four. And that works, if only because most of us fly guys are middle-aged white men. In truth, the good cast, especially in a moving, roiling river current, actually revolves around a syncopated rhythm. A jazz rhythm. It’s one, and two, and three, and four, with the extra “oomph” and emphasis on those “and” marks between the beats. When you play a cast according to a straight march tempo, you get plain (often open) loops in the air. But when you syncopate, and drive that casting rhythm, in the jazz style… well, that’s when the loops get tight, and the cast cruises for distance. So if you want to add another 10 (accurate) feet to your cast, next time you’re on the water, take “John Phillip Sousa” out of the equation, and put a little “Marsalis” into it. Syncopate, and emphasize that on both the forward stroke and the backcast, you’ll add a little more jazz tempo… and you’ll be surprised where that fly ends up. Odds are, you’ll be right on target, right on tune, and right in tempo to hook the big brown trout slurping along the bank.